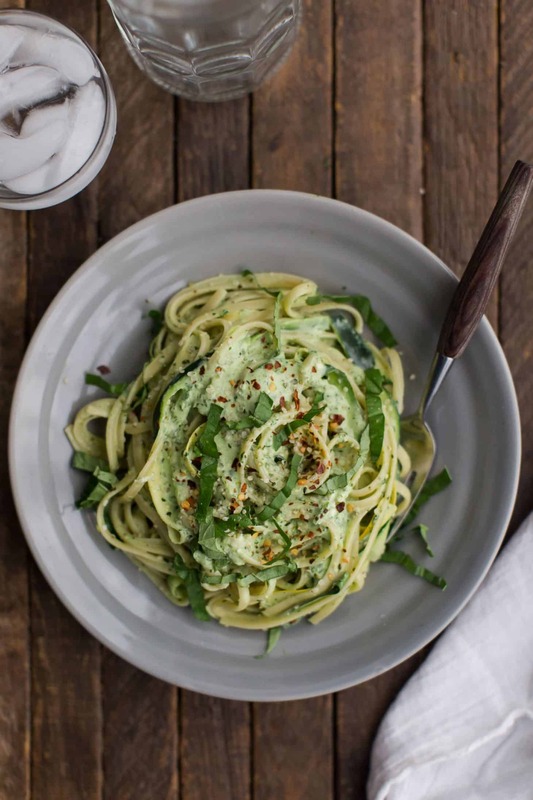 Summer Squash Pasta with Yogurt Sauce | Naturally. When I think of pasta in the summer, I almost immediately think of the mayo-laden macaroni salad or the pasta salad that almost always has cubes of cheese. Neither of these examples are what this summer squash pasta is all about. While this pasta dish can be served cold, I like to use the heat of the noodles to balance the chill of the yogurt for a just-warm, perfect summer pasta. Also, if you want to take this dish an extra step, it’s perfect with homemade whole wheat pasta. 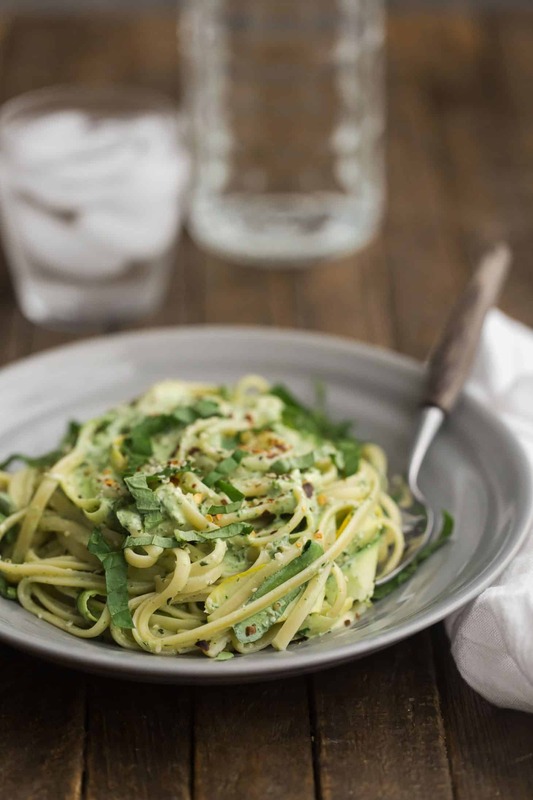 A light and fresh summer pasta dish with an easy yogurt sauce and fresh zucchini ribbons. 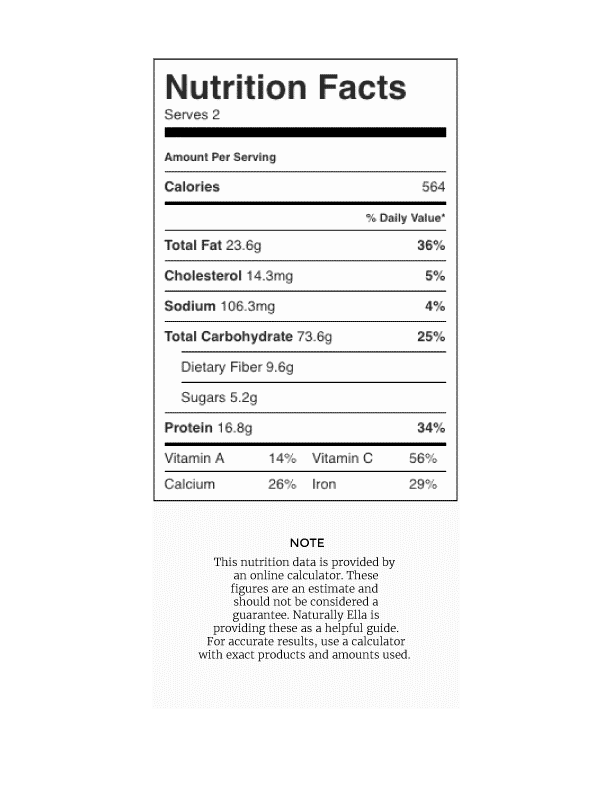 Cook pasta according to package, Drain and place in a large bowl along with the squash ribbons and hemp seeds. In a blender, combine the basil, 1/2 cup yogurt, feta, olive oil, lemon juice, garlic, salt, and pepper. Pulse until the sauce is well combined. Add up to 1/4 cup more yogurt as needed to thin out the sauce slightly. Taste and adjust lemon juice, salt, or pepper as needed. Pour 3/4 of the sauce over the pasta mixture and toss until well combined. Serve with an extra drizzle of sauce and a sprinkle of basil, hemp seeds, and/or chili flakes if desired. Tips & Tricks: The easiest way to make squash ribbons is to use your vegetable peeler and instead of just peeling the outside, continue to peel the entire squash from top to bottom. 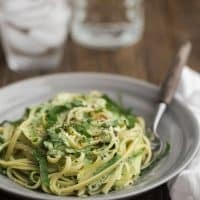 Pine Nuts: I traditionally like to make the pesto a little more traditional-pesto based using toasted pine nuts but I’m not always able to find fresh, good pine nuts. If you happen to have some, you can toss them into the sauce or toast and use in place of the hemp seeds. Tomatoes: I love adding tomatoes to everything during the summer. Burst a couple cups of cherry tomatoes and toss in with the pasta. Grilling: We grill zucchini out a lot during the summer. Grill a few extra strips of zucchini then cube and toss into the pasta in place of the zucchini ribbons. I feel like zucchini gets all the love when I actually prefer the quirky yellow squash and all the fun varieties. 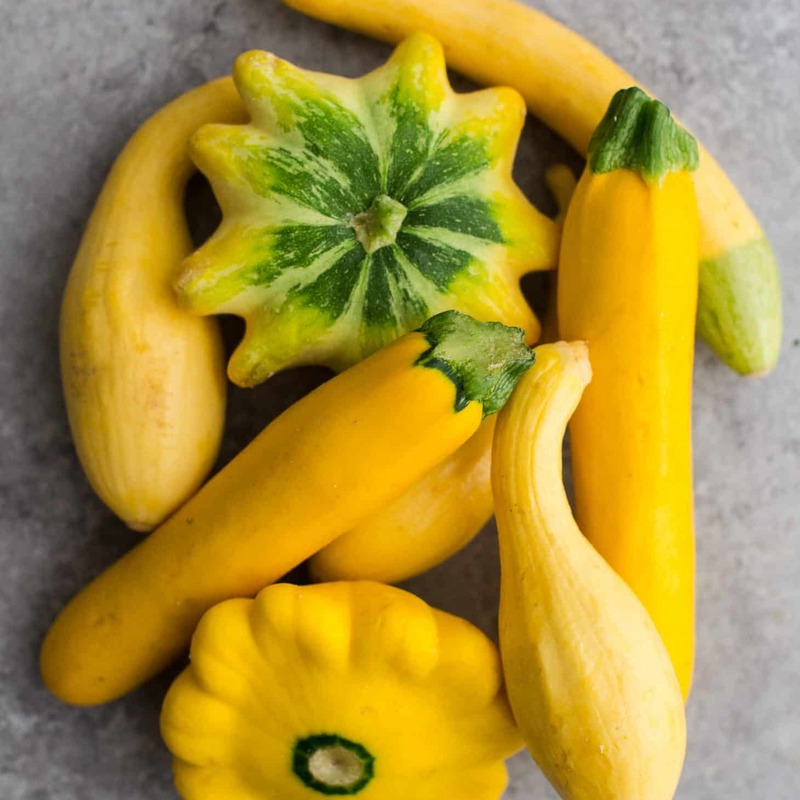 While this summer squash pasta is best suited for the long crookneck or zephyr yellow squash, patty pan squash can be fun to grill whole (if small enough) or cut up in discs for salads. I can’t get enough summer squash these days. This pasta looks like my ultimate comfort food!! Thanks for yet another great recipe. I made the dish today and it was amazing!